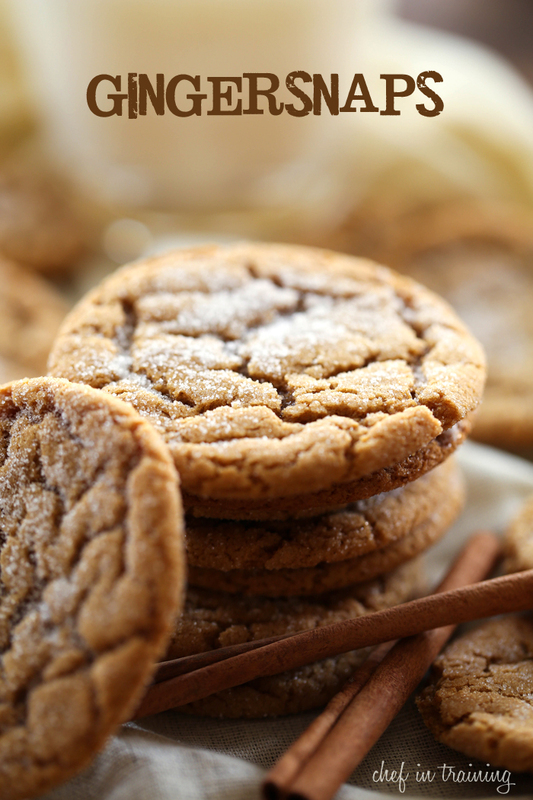 Gingersnaps are a classic winter recipe! These cookies are SO easy and so good! These cookies would make a fantastic recipe for your cookie exchange. My family couldn’t keep their hands off of them! An easy, delicious and classic winter recipe! These cookies are SO good! Cream butter and sugar together in a large mixing bowl. Add egg and molasses and beat until well mixed in. Add ginger, cinnamon, cloves, salt, baking soda and flour and mix until well combined. Roll into 1 inch balls and roll each ball in sugar. Repeat for all the dough. Place on greased baking sheet and bake at 350 degrees F for 13-15 minutes. Nikki I looooove gingersnaps! I could eat them til my mouth was hot from ginger and my jaw was sore from all that snappiness :) But yours are soft, the best! Love these and pinned! I love those perfect crinkles, too! Newbie at this...do I flatten the balls, or do they do all the work in the oven? Cannot wait to try these!! These are one of my favorite cookies. My mom use to make these cookies all the time when I was growing up. I miss her, maybe I will have to try these out in her honor. these are molasses crinkles, not ginger snaps! ginger snaps usually have a whole tablesppon of ginger, no cloves and less molasses. i just made this recipe and was very disappointed - the cookies are great, but i wanted ginger snaps not molasses crinkles! This is almost EXACTLY like my family recipe for Gingersnaps!! It was always my Dad's favorite and I always had to make them if I was doing any other baking. The soft, chewy cookie is to die for..and the way they melt in your mouth makes them a dream. I've seen other recipes for Gingersnaps, but none have ever lived up to my own family recipe..til NOW! Thanks so much for sharing!! Made this recipe and it was awful - like another poster said, this is a recipe for molasses crinkles. So, I made a second batch, halved the molasses, tripled the ginger and doubled the cinnamon. Now THAT was a Gingersnap! You mention 1 cup of sugar and then 1/2 cup on sugar at the end. It is 1.5 cups of sugar or is there a small typo here? thanks!